We are at 12,227 feet. Khumjumg if nice. I feel well. No headaches, just a little tired. Right now I am in a very small room with just 2 beds. 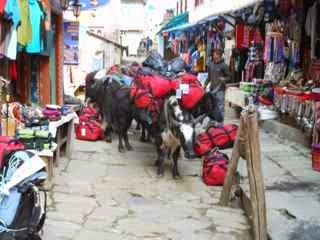 Right outside our door are all of the yaks that carried our gear. I feel the cramped space like a big box around me. I taste nothing. I smell also nothing except the smell of all of our sweat. I like our second room the best. IT had 5 beds, bed heaters, and a private bathroom. Our first room was also nice. It had 2 beds and also a private bathroom. At our current hotel we have to share the bathroom with everyone. Also the toilets are simply holes in the ground. 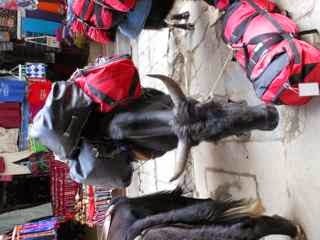 The Sherpas are amazing. Every morning they bring us tea. At breakfast they bring us more tea and serve us our breakfast before eating themselves. During the hike, they help us and lead us. They serve us also for lunch and for dinner. 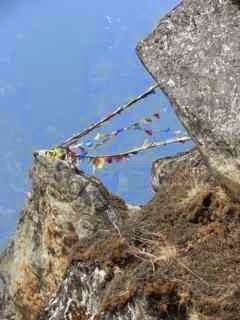 I am so grateful for the Sherpas. 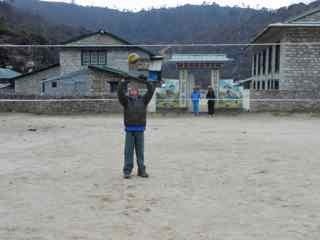 They have a volleyball court in Khumjumg. We played for a little while but stopped because we were short of breath, tired, and the ball almost went in Yak poo - there is yak poo everywhere! A volleyball court on route to base camp, Everest? That is amazing. I looked up what a yak is. A wild buffalo (most are domesticated) found in Tibet, C.Asia, Mongolia and Russia. That's where my red and black hat went!